If a family member is transitioning to home care, it can be a very stressful time for everyone involved. Planning ahead of time with a facility that is specialized in home care health in Memphis can help to make this process and easier one. It is important to remind your loved one that this transition is a new process and things are going to be different than they may be used to. Planning any changes to the home should begin immediately. Also, hiring a home health aide early on will be beneficial to ensure that recovery for the patient will continue at home. Reach out to the rehab facility to understand what is needed at home for the recovery to occur quickly and safely. Lastly, recognize that it is okay to have help when caring for a loved one. Self-care is necessary for everyone to stay healthy. Allowing someone to help you care for your family member is the best way to help everyone’s health. Caring for a loved one at the end of their days is one of the most precious gifts you can give. Choosing where and how this care is given can be a difficult choice to make, but fortunately there are options. In the past, staying at home was the norm. However, today more people spend their end-of-life at a nursing home or hospital. 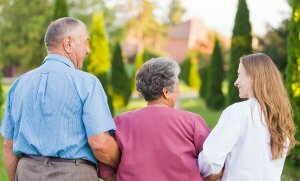 When you find the option that best suits your needs, your loved one will get the elder care near Memphis that they deserve . Read on to learn about comfort and care at the end of your loved one’s life. Due to the many pressures of the outside world, caring for your loved one can be hard to fit into your daily life. For this reason, many people are choosing to let their loved ones spend their final days in a nursing home or hospital. This is a great option for individuals who have severe physical ailments, such as heart failure. However, this choice may not be ideal for those who are wishing to make sure their loved ones receive the one-on-one special care that they so deserve. Also, this option removes your loved one from their home, which can be a hard transition in itself. Home health care is another option for your loved one. It offers the luxury of allowing your loved one to spend their days in a familiar setting, while allowing you to feel safe that they are receiving the special care and attention they deserve. Home care can be exhausting for family members and many people have busy lives they also need to tend to. Hiring an at-home care professional is a wonderful way to ensure that comfort and safety are a priority for the person in need of end-of-life care. It also allows you and your family to maintain the self-care needed as your loved one needs more personalized attention. Working with a specialized in-home care company in Memphis is a great way to provide your loved one with respectful and comfortable end-of-life care.